Iowa State University researchers have developed these "plant tattoo sensors" to take real-time, direct measurements of water use in crops. Larger photo. Photo courtesy of Liang Dong. AMES, Iowa – Iowa State University plant scientist Patrick Schnable quickly described how he measured the time it takes for two kinds of corn plants to move water from their roots, to their lower leaves and then to their upper leaves. The tool making these water measurements possible is a tiny graphene sensor that can be taped to plants – researchers have dubbed it a “plant tattoo sensor.” Graphene is a wonder material. It’s a carbon honeycomb just an atom thick, it’s great at conducting electricity and heat, and it’s strong and stable. The graphene-on-tape technology in this study has also been used to produce wearable strain and pressure sensors, including sensors built into a “smart glove” that measures hand movements. Researchers describe the various sensors and the “simple and versatile method for patterning and transferring graphene-based nanomaterials” to create the flexible sensors in a paper featured on the cover of the December 2017 issue of the journal Advanced Materials Technologies. The research has been primarily supported by the Faculty Scholars Program of Iowa State’s Plant Sciences Institute. Liang Dong, an Iowa State associate professor of electrical and computer engineering, is the lead author of the paper and developer of the technology. Seval Oren, a doctoral student in electrical and computer engineering, is a co-author who helped develop the sensor-fabrication technology. Co-authors who helped test applications of the sensors are Schnable, director of Iowa State’s Plant Sciences Institute, a Charles F. Curtiss Distinguished Professor in Agriculture and Life Sciences, the Iowa Corn Promotion Board Endowed Chair in Genetics and the Baker Scholar of Agricultural Entrepreneurship; and Halil Ceylan, a professor of civil, construction and environmental engineering. “We’re trying to make sensors that are cheaper and still high performing,” Dong said. The process can produce precise patterns as small as 5 millionths of a meter wide – just a twentieth of the diameter of the average human hair. Dong said making the patterns so small increases the sensitivity of the sensors. A new three-year, $472,363 grant from the U.S. Department of Agriculture’s Agriculture and Food Research Initiative will support more field testing of water transport in corn plants. Michael Castellano, an Iowa State associate professor of agronomy and William T. Frankenberger Professor in Soil Science, will lead the project. Co-investigators include Dong and Schnable. The Iowa State University Research Foundation has applied for a patent on the sensor technology. The research foundation has also granted an option to commercialize the technology to EnGeniousAg – an Ames startup company co-founded by Dong, Schnable, Castellano and James Schnable, an assistant professor of agronomy and horticulture at the University of Nebraska-Lincoln, a collaborator on another Iowa State sensor project that sparked establishment of the company (and Patrick Schnable’s son). But that’s not all the sensors can do. The technology could “open a new route” for a wide variety of applications, the authors wrote in their paper, including sensors for biomedical diagnostics, for checking the structural integrity of buildings, for monitoring the environment and, after appropriate modifications, for testing crops for diseases or pesticides. Iowa State's Liang Dong is leading development of graphene-based, sensors-on-tape that can be attached to plants and can provide data to researchers and farmers about water use in crops. The technology could have many other applications, including sensors for biomedical diagnostics, for checking the structural integrity of buildings, for monitoring the environment and, with modifications, for testing crops for diseases or pesticides. “The most exciting application of the tape-based sensors we’ve tested so far is the plant sensor. 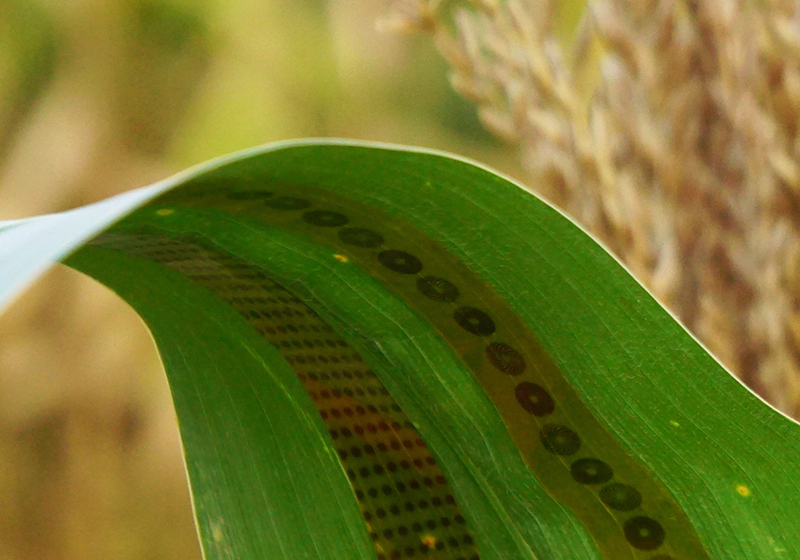 The concept of wearable electronic sensors for plants is brand new." "Wearable Electronics: High-Resolution Patterning and Transferring of Graphene-Based Nanomaterials onto Tape toward Roll-to-Roll Production of Tape-Based Wearable Sensors," doi:10.1002/admt.201770055.